There's a friend of my parents' who I end up doing alot of computer work for. 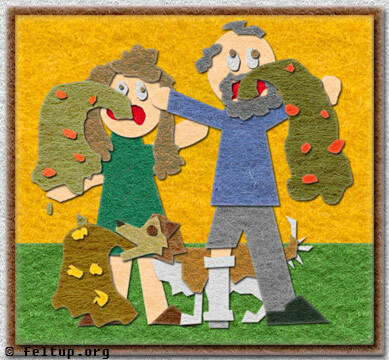 The other day the wife was baffled because her, her husband, and their dog all had "the flu", which to them involved vomitting and diarrhea (the latter I'll save from feltitizing). When such a sudden pukefest comes on, it's usually not "the flu". The real flu is a respitory thing, not a spew-out-both-ends thing, that's called "food poisoning". This family does provide quite a bit of entertainment though besides their wacky theories. The husband (whom I refer to as Jim-Bob though neither is his name) is leggless below one of his knees. He has fashioned himself a prosthetic out of a piece of plastic PVC pipe, commonly used for sewage purposes.